Those that we have been a turning the meteorology as a science that studies the movement of gases in our atmosphere (a branch of physics) we always liked the mountains and surprised time. A mountain, an elevation of land, is a natural barrier against the natural movement of our atmosphere (lease natural movement the pressure difference due to sunlight, the sun’s heat, cooling sea water and the rotation of the Earth which means that there is wind). In our atmosphere, apart from oxygen, nitrogen, carbon dioxide, carbon monoxide and noble gases are also water vapor. The only way to “stop the steam” in order to condense at the same height (come on, who does not rise, cool and condense) is putting a screen, a mountain. If you spend large amounts of air with water vapor and stand with mountains, clouds may form so-called “hat” or “cap”. 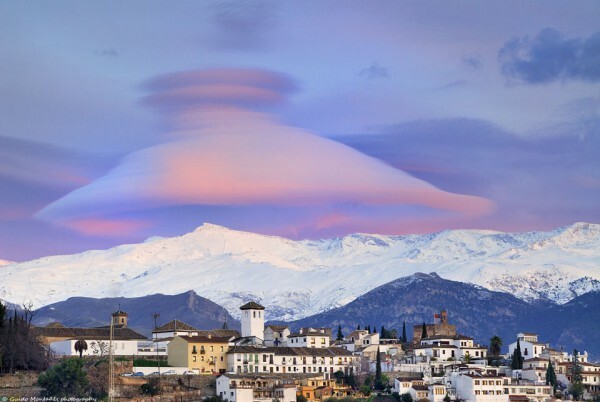 Those clouds are what you see in the picture in Sierra Nevada (whether in Spain). In this case, the air has been met with a wall of rock that has pushed up. The direction of the rising air is precisely the mountainside bouncing off the top and giving the appearance of a hat. And yes, it is very nice.